Since Carla and I were getting married in North Carolina, we wanted to invite everyone to our rehearsal dinner. Most of our guests would be coming from Pennsylvania, with a few trekking in from New York, Ohio, Indiana, and Florida. A few guests came down early, but most drove in the day of the rehearsal dinner. We wanted a place casual enough that they could just roll into the dinner in their road grime clothes, but also a place that had awesome food to help make the trip worth the drive. After looking at 5-6 places that didn't work out, we found a seafood place that seemed ok. It had been a long weekend of wedding planning on the outer banks, so we were pretty run down. This was in March and we were staying at the hotel were we would eventually have our reception. 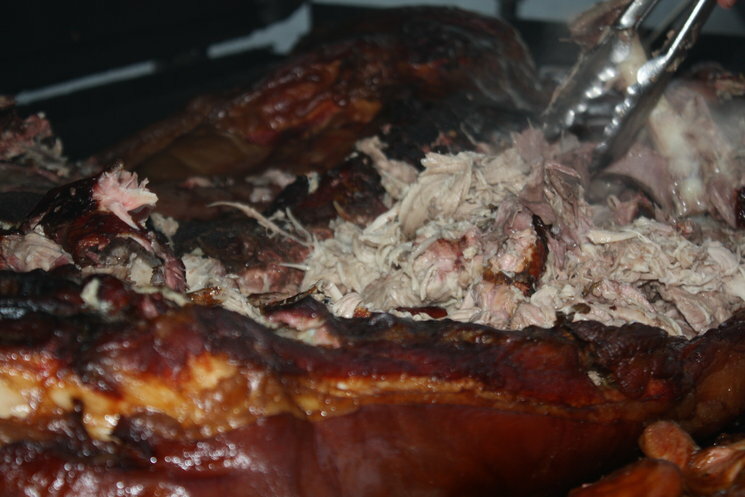 Needing a sustaining lunch to continue with our matrimonial strategizing, I put my snout in the air and caught a whiff of smoked pork. Piggy! 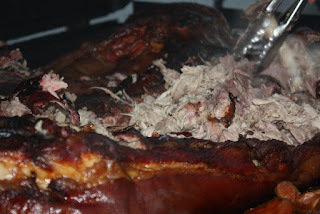 The aroma of hot pork called out to me like the siren song of a bewitched sailor. As my glazed-over eyes sparked back to life, I saw the source of this delicious smell: High Cotton BBQ. Right across the street from out hotel! How could our marriage not be blessed, to find the ocean on one side of our wedding, and BBQ on the other. We went in and ordered two platters. The food was amazing. It was perfect. The meat was tender, well-seasoned, and deliciously smokey. Although some may roll their eyes at a Northerner spouting off BBQ pro's and con's, I've got enough pig heads under my belt to stand behind my beliefs. 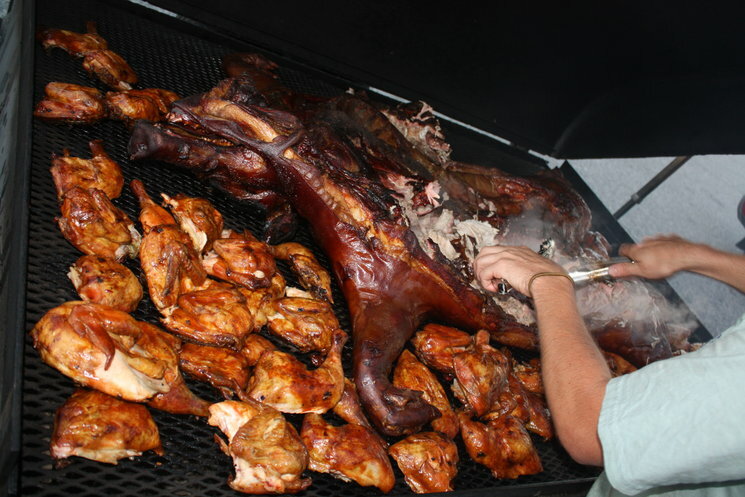 In the world of BBQ, my favorite is Texas-style, with big slabs of heavily smoked meat weighing down the table. The meat is so tender and intensely flavorful that you don't even need sauce. I think the midwestern BBQ's of sticky tomato and brown sugar sauces hide that delicious meatiness. On the East Coast, Carolina BBQ favors a thin, vinegar-based sauce that leaves behind the heavy, sugar-coated glazes. Squirting a bit of High Cotton's "pig pickin' sauce" was the perfect way to cut through the richness of the pork, while still savoring the smokey, juicy flavor. The fried chicken was a revelation on how I should be making fried chicken. Rather than a thick, flour paste tomb of batter around the chicken, the segmented chicken parts are tossed in a light coating of cornmeal and fried to a crisp, bronze perfection. It was crisp and juicy, without having to bite through a dense crust of coating that immediately robbed your mouth of any chicken flavor. I felt enlightened and happily stuffed. We spoke to an incredibly friendly man named Will about the idea of having our wedding reception there. As we chatted, he mentioned he was one of the owners. The awesomeness of High Cotton BBQ clears stems, in great part, from Will. 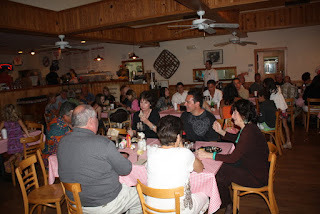 Every member of the staff, from the wait staff to the cooks, was genuinely friendly and helpful. Still, Will is really cool. And he knows his cheese! I brought a big cheese plate with 4-5 lb wedges of three of my favorite cheeses. I think our reception was the first wedding reception to have a sheep's milk cheese from a benedictine monastery in the Pyrenees served as an appetizer to Southern BBQ. Well, this post is running a bit long, so let me finish with the conversation that forever stamped me as a lifelong fan of High Cotton BBQ. 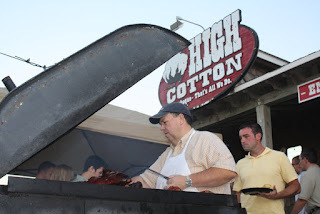 Along with their indoor kitchen, High Cotton has several larger smokers for doing pigs and vast quantities of quartered chicken. When we dropped off the beer the morning of our reception we saw two such iron beasts smoking away behind the restaurant. I asked Will if they were catering another party tonight, as we had just ordered one smoked pig. "Yeah," he replied, "the second one is getting delivered to a guy later tonight. We gave him the propane smoker, your pig's getting cooked on charcoal." Now that's just being awesome. Plus he gave me the leftover pig head to take home and eat. Num num num. I loved the meal at high cotton!